What is a futon, you ask? A futon is really just a big pillow. A big pillow that you sleep on like a mattress. It doesn’t offer spring-loaded, foam-cuddly support, but for sensitive backs, a futon is actually better – it provides a flatter sleep. Futons are the best things a destitute mover has going for them. I mean, if you’re trying to make it big in New York City by way of Kansas and with $500 to your name, you best not be moving a queen-sized bed across the country. No way. Go with a futon. In this article we will explain why you should get a futon and how to move with a futon. They’re cheap – Futons can run as little at $70. You can get nicer ones for many hundreds. Most of the price differential is attributed to the frame, which isn’t necessary. The pad itself can be found for under $50. 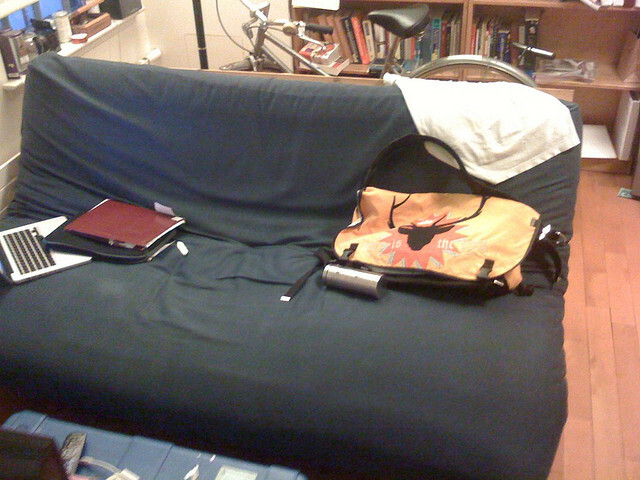 They’re flexible – Futons can be couches or beds, depending on how you fold the frame. Or you don’t need to use a frame and just let the futon sit on the floor, Japanese-style. They’re easy to move – Futons can be rolled, folded and squished into the backseat of a car, so just about anyone can move with one. Additionally, a single person or normal size can carry (or drag) a futon. Futons can be had just about anywhere, including large department stores, like Target, furniture stores, like IKEA, bedding stores (obviously), and a local arts and craft shops. Moving a futon is a cake walk compared to a bed. Place a string of sturdy, tie-able rope on the ground. Lay the futon on the rope. Tie the rolled up futon in place. Protip: For the best moving for cheap/destitute/winging-it wildly movers, don’t even bother to bring the frame. Sleep with the futon on the floor. You can buy a frame later once you’re settled in life. Learn more about how to move on your own.